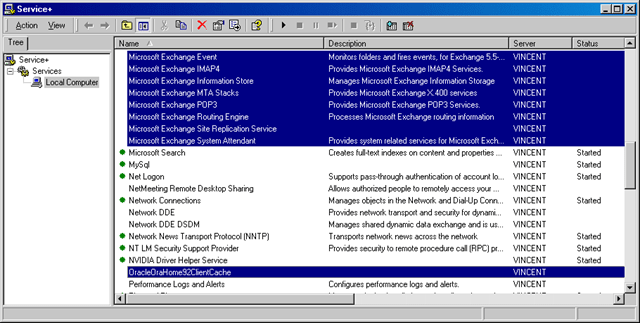 As a professional tech, I spend plenty of time using the Windows Services MMC snap-in (Administrative Tools –> Services). The interface has always been slightly annoying. It allows you to get the job done but the window size cannot be saved (I find myself immediately resizing the window to full-screen – I could probably use some sort of macro utility to do this for me but.. why should I?) and it always takes a few seconds to start up. Enter Service+. There are two versions of it – the light version (which I’m using, is free, and which is the basis for this article) and the full version. The light version does everything I, and probably most people, will need. The program appears to be installed in the form of a Control Panel applet, but it is able not only to automatically run at startup, but to provide you with an easy-access system tray icon just like any “regular” app. From this interface you are able to see all services, start and stop them (this includes multiple services at the same time – which is AWESOME), and doubleclick on them to view their properties and disabled/manual/automatic startup settings. Apart from that it’s very lightweight (only takes up 7Mb in the background) and given the fact that you’ll never need to run the Services snap-in again it’s definitely worth it. The full version has more features, so, from their webpage, FYI here are the differences between paid and free: missing from the free version are the possibility to kill a dead service that no longer responds to the stop command (this lets you restart a failing service without having to reboot the server), changing multiple services password or startup settings at once (this feature can save you hours of work if you manage a large number of servers), removing a service (this will let you cleanly remove a service without having to edit the registry and reboot the server), and automatically attaching a debugger to a service.